Thank you Dina and Pianissimo! Her eyes are amazing. At once far away and completely present. Dazzled and deep! I am revelling in her, she is so strong and vulnerable at the same time. I love her wide hips and slenderness. She is fabulous! If you get a chance to photograph your beautiful trios eyes please do. They are all so marvellously different. I am so pleased to have her. One of the most difficult things in this hobby is not being able to actually see dolls first hand before we buy. A photo can be captivating but it's only when we actually have the doll in hand that we become truly aware of the artistry of its creator. If we can hold a doll and connect, rather than simply admire the beauty, then that is a sign of a truely talented artist. It's a difficult thing to explain, I felt this way with each of my Lene dolls, each in a different way. I'm so glad Pearl has gone to you. Well said and very good explained :-) I know exactly what you mean. Every time I look at Pearl my heart melts. Wow these dolls are gorgeous! What awesome coloring! She is! I was, it is very rare that I have money to spare so snap her up I did. However, it's come full circle and I must with heavy heart let her go. The photo does her no justice, she is sublime. So I packed Pearl off to her new owner. It was a lot more difficult emotionally that I thought it would be. I was in touch with her maker which helped. I hope to see Pearl again and that she'll find her way to the forum. 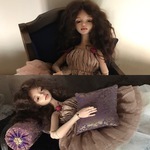 I hope someday to house a "Dolls Beyond Art" creation again someday. 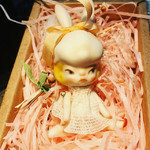 I'm so glad Pearl has found a new home, Lene's work is very special. Perhaps we'll see Pearl again here - I hope so . I’m sure whoever adopted her will be quite happy! Hopefully they are or become a member here.